That cute lil’ vintage ornament is sitting on our very silver tinsel tree decorated with a host of other vintage ornaments and sparkling pink lights. My favorite fancy pine candle is lit and spreading that “real” balsam pine smell throughout the room. Presents have all been wrapped up with silver paper and pretty bows and there’s a large bottle of amaretto in our liquor cabinet (essential for my favorite holiday drink: the amaretto sour). Rum cookies have been baked (recipe to come), coconut chocolate almond bites shipped, chocolate nut & fruit bark has been given away to friends, and my favorite holiday movie has been watched. Christmas is almost here! 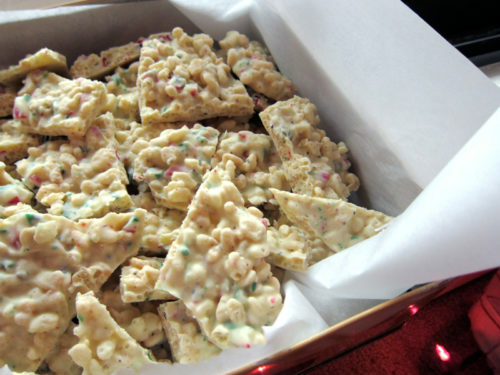 One of my favorite Christmas traditions to make is candy cane bark. White chocolate + candy canes is a cinch to make, very festive-looking and it’s always appreciated. 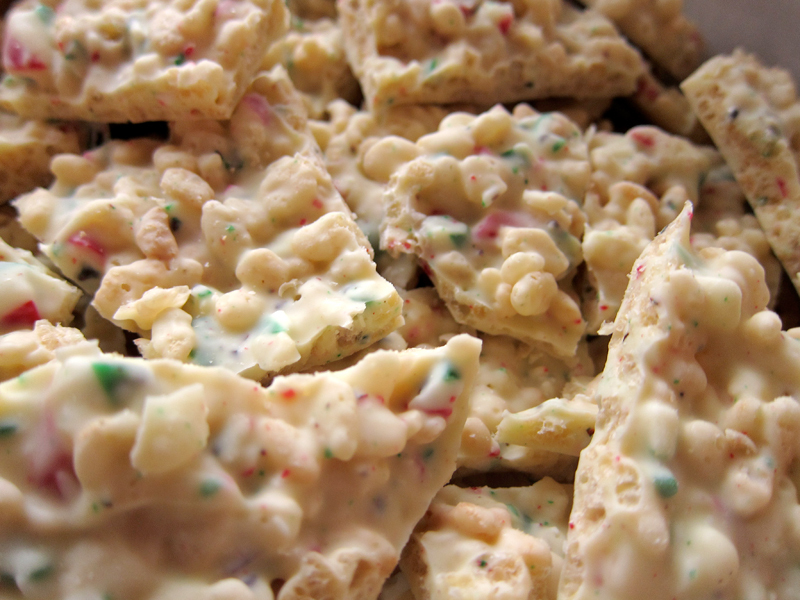 This year, I decided to shake things up a bit after seeing Shutterbean‘s candy cane bark. The addition of rice krispies makes this into a festive Crunch bar and adds an unexpected texture. It also helps to cut the sweetness just a tad, which is always welcome this time of year. Tracy added the candy canes last and pressed them into the chocolate. Not me. I just stirred everything in all higgledy piggledy because I figured the mish mash would work well. I loved it and this will be my new holiday favorite. Hooray! tip: This year I discovered THE BEST way of crushing up the candy canes. Add the candy canes (unwrapped) into a closed ziplock bag. Now, double bag it. Then place a folded tea towel on a wood table or chair and place the bag of candy on top. Put another folded tea towel over the candy bag. Use a heavy rolling pin (wood works fine) and bash the living day lights out of the candy. Smushed to smithereens without shredding the bag and getting candy everywhere! Perfect. Now only if I could easily find red and white candy canes in Vancouver as opposed to the green-red-white ones that seem to be everywhere, I’d be one happy lady. What gives, Vancouver? Have a great holiday! Enjoy traditions new and old. Merry Christmas! Prep a cookie sheet with waxed paper or silpat. Using a bain marie or double boiler, melt the white chocolate being careful to not get any water in the pot (this can seize the chocolate which is a bad, bad thing). When the chocolate is melted, remove from heat and add in candy canes and rice krispies. Stir until combined and then pour onto prepared cookie sheet. Refrigerate until hardened, about 1 hour. Break apart into shards. I bet that smashing method is also a really awesome stress reliever. Merry christmas chica! This bark looks wonderful! Merry Christmas,Jeanetter!Loved your Cane crisp bark recipe!I’ve added a link to this lovely post of yours on my blog as part of a special selection for Christmas so that my blog readers can enjoy your recipe as well! 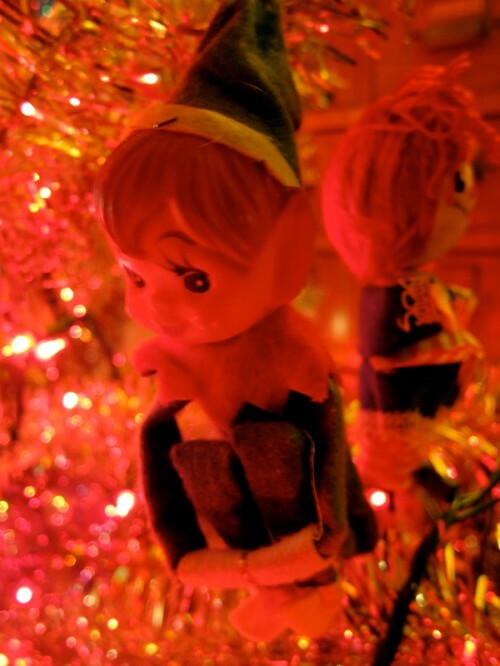 We used to have a little elf ornament just like that (where did it go?) The candy cane bark looks delicious! I was shocked to look in my sister-in-law’s pantry last night and see boxes and boxed of store-bought peppermint bark. She loves it and hoards it for the coming year. I am going to make her some of this delicious stuff. And THANK YOU for the tip! I avoid treats involving crushed candy because I can’t see to crush without making a mess! I saw this on Tracy’s site and it looks fantastic! Thank goodness for Rice Krispies! Merry Christmas, Jan! Holy Smokes, this looks good – and I’m stuffed from turkey dinner leftovers. Hmm, New Year’s dessert buffet? I’d be ever so popular. Hope your holidays are splendid. Love the tinsel tree… bark looks delicious. Merry Christmas! Oh! My husband loves rice krispy treats. Those might be really good. Better write it down for next year. Thanks for sharing. 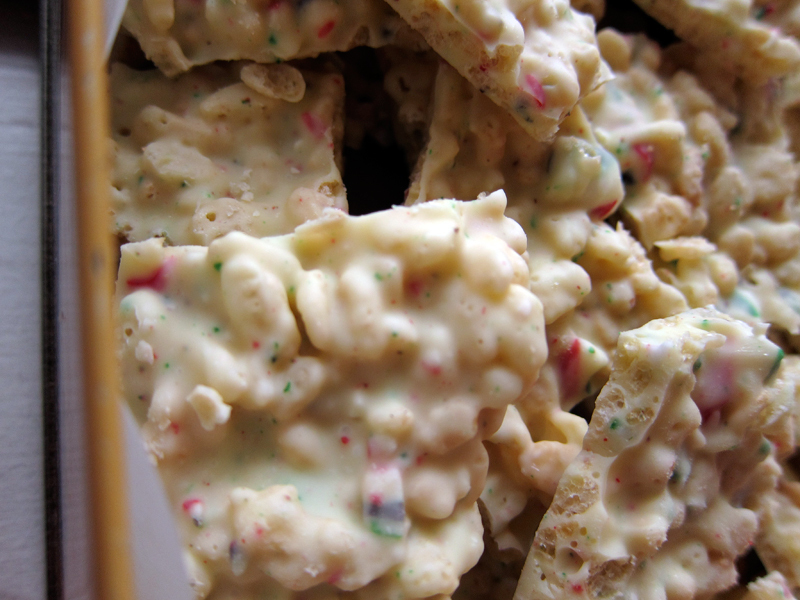 What a fun idea to put Rice Krispies in the bark. I’ll have to try that next year. Definitely Joanne, get yer ya-ya’s out! Thanks for the awesome idea, Tracy! I just ate 3 pieces for breakfast. Oops! Thanks for dropping by, ww&w! Oooh, I love that elf, LIsa, and I’d be seriously bummed if we lost it. Hope you had a great holiday! Dana, it’s such a mess, but this tip saved my floors this year. And shame on your sis, but props to you!! Hope you had a great xmas! Val, I love the tinsel too. Thank so much. Heather, please do, it’s a keeper. I knew you had great taste, Lynn! Oh boy, this is seriously dangerous stuff! I want to make it but will end up eating it all. And um, let’s just say my jeans have become much tighter this past month. Honestly, I can’t seem to find Callebaut chocolate anywhere. I know it exists, I’m just not searching in the right place, so I end up buying Baker’s brand baking chocolate, it seems to work fine. Bookmarking this for future enjoyment! Merry Christmas! Be grateful you even have candy canes, never mind what colour – I’m in Sweden and they don’t carry them anywhere over here! Bijoux, I hear you on the jeans front. I’m going to start again my exercise program because things were getting too slack in December. As for Callebaut, I find it at a local gourmet shop down the street (I’m lucky that way). Bookmark away! Eva, I understand about the boring. This one is so good it will replace any old bark recipes. Thanks Katina, it’s true. I’m happy with my candy canes. A world without candy canes? That is tough! Yum – it’s a favourite in our house too! Finally found red/white peppermint canes at Walmart. I get all of my baking callebaut at the Superstore (cheapest) or Save-on foods bulk section. Happy New year! Good to know that red & white ones do exist and great tip about the callebaut! Thanks & happy new year to you too! Easier way to crush candy canes: Food processor. You’ll have a fine powder in no time.